In the mid-1970s our family went through major changes. After years of pain and travail, mom had died of cancer in the summer of 1976, and dad—Bud—continued to live on alone in the old family house on a hill, overlooking the mouth of the Columbia River near Warrenton. My sister Laural had recently graduated from college, and was living and working near Portland. With my partner John, I lived in the tiny town of Jacksonville, Oregon, where I was the librarian with a historical museum. A Christmas gathering was planned to bring the scattered and tattered family together. A right proper feast was called for to reinforce our connections with one another, including our mother’s older and widowed sister, Dorothy, the dearly beloved aunt. Bud was quite a decent cook, and he liked to try new things. He decided that this gathering we were to have a roast goose. While he had never cooked one before, he had recently seen a Christmas goose recipe, and this, he determined, would be the centerpiece. But a goose was hard to come by on the northern Oregon coast. John knew where we could get a fine but frozen goose in Jacksonville, and we volunteered to bring said goose to Warrenton. However, there were complications. We did not own a car, we didn’t have the money to rent one, and neither of us had a driver’s license anyway. To take a plane, encumbered with a frozen goose, was even more improbable and expensive. So we cadged a ride with friends for the five miles to Medford, and then took an overnight Greyhound bus to Portland, 275 miles to the north. It was an ordeal. Riding the ‘hound was seldom a relaxing journey in the best of circumstances; at night, with the Christmas crowds, with gifts and luggage and a frozen goose, it was hellish. The body heat of forty-odd passengers was unnecessarily supplemented by a fiendishly effective heating system that pumped hot air directly onto the goose that had to be wedged beneath our seat. We had insulated the goose with layers of newspaper, but we had to enhance its wrappings with our winter coats and hope for the best; we kept rotating the goose so it wouldn’t get hot spots. Sleep was fitful. Our seven-hour trip ended in Portland at an ungodly early hour, and there we waited for Laural to arrive in the Blue Bomb, her much-beloved rattletrap baby-blue Nash Rambler of barely post-World War II vintage. The Blue Bomb carried us all, and the wilting goose, safely if not swiftly to Warrenton, ninety miles to the west, where proper thawing was in the cool garage. Bud was delighted with our bird, and he had a jolly good time fussing over it. It went into the oven artfully trussed, and properly pricked all over to drain the plentiful goose grease. As it roasted, it sent out the most gratifying aromas. The recipe had warned there would be goose grease spattered wildly about the oven, but no matter. 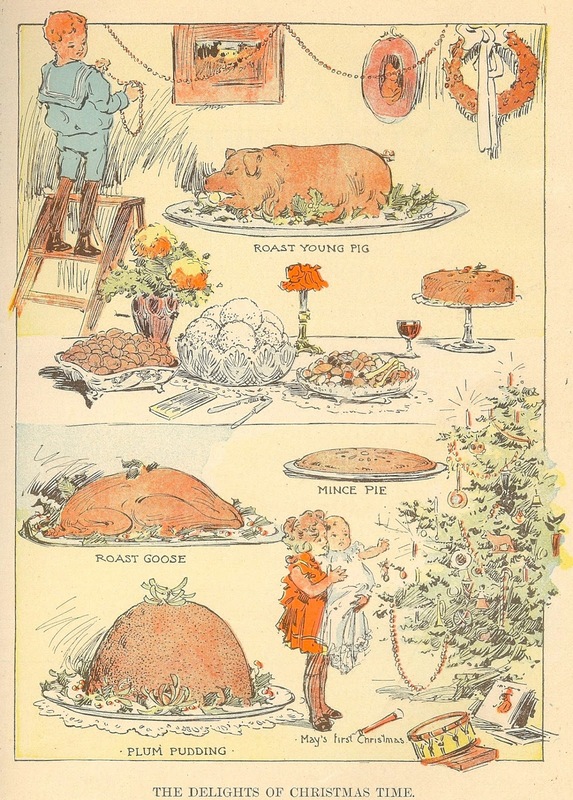 The goose was a triumph of crackly brown skin and utterly delicious flesh. I have no recollection of anything else we ate at that dinner, the last family meal I remember in Warrenton. Bud, Laural, Dorothy, John, and I had a fine feast. The bird was a triumph: the best goose ever. what a marvelous memory. Did you know that Canada geese live to be 25? The wild ones would seem to live longer than the domestic geese. I think our Bear Creek Valley goose was rather younger!